Door de Algemene Ledenvergadering van JIN is medio 2017 ARLèNE TEL als voorzitter benoemd. Zij is een sansei evenals secretaris Dylan Sinay; Marcel Reijnst is penningmeester. 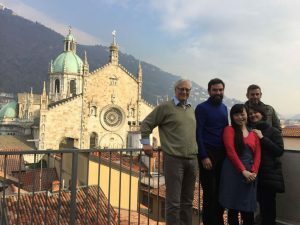 Op 7 december 2018 werd de film Children’s Tears; searching for Japanese fathers van Yuki Sunada vertoond in Como (Italië). Erna werd een Honorary Award aan haar uitgereikt, de zogenaamde Mercurius prijs. Deze is geïnspireerd door Jungiaanse psychologie. Informatie van de jury: ‘The International Award “The Mercurius Prize”, based in Zurich, was founded in 2017 with the goal of promoting a connection between the world of Jungian psychology and the audience, film-makers and authors in the world of cinema. In this perspective, the Mercurius Prize will be awarded to films, shorts and documentaries of particular psychological relevance and sensitivity to human rights, capable of promoting awareness and sense of responsibility both on the individual and on the collective level. The Mercurius Prize Committee, as a Jury, takes into consideration every form of filmic expression: feature films, shorts, documentaries and cartoon films.’ Op de foto Yuki met de jury, met o.a. voorzitter prof. Murray Stein, Luis Mori en artistiek directeur Dr. Chiara Tozzi. Op het balcon ook Han Gieske, die voor JIN(ners) was gaan kijken. The Mercurius Prize Committee is pleased to present its Honorary Award to Yuki Sunada in recognition of the psychological sensitivity and cinematographic excellence shown in her film “Children’s Tears-Searching for Japanese Fathers” Her film was selected for this award because of its strong affirmation of human rights, particularly the rights of children who suffer from the injustices inflicted on them under conditions of war and migration. The film tells the story of bi-cultural adults (Japanese/Dutch) who lack knowledge of who their fathers are and who as a consequence suffer from unstable social and personal identities. It also suggests the importance of a father’s presence in the psychological development of children, and it shows the viewer the poignancy of the absence of such a paternal figure. In addition, it introduces the viewer to a person who attempts to assist in healing this wound by finding a bridge between past and present and between these children and their unknown fathers. This bridging is transformative when it is successful and is a feature of the activity of Mercurius, the depth psychological agent that works to join together what has been torn asunder. The spirit of Mercurius is therefore an apt metaphor for the film’s vision of healing and possible transformation. 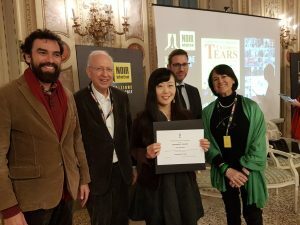 The Mercurius Prize Committee therefore takes great pleasure in giving its Honorary Award to filmmaker Yuki Sunada at the Noir in Festival 2017.